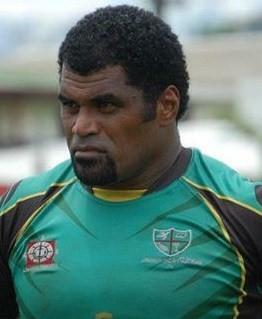 Marika "Dawainavesi" Vunibaka (born 3 November 1974) is a Fijian rugby union footballer. He has represented the national team on numerous occasions, including at the 1999 Rugby World Cup in Wales and the 2003 Rugby World Cup in Australia. He represented Fiji at rugby sevens level from 1997–2008 and is one of the few sevens players to play in 3 Rugby World Cup Sevens, 1997, 2001 and 2005. His team won the World Cup in both 1997 and 2005 where he was the top try scorer in the 1997 world cup. He is currently ripping and a tearing with the mighty Leeton phantoms formimg a dynamic combination with Tim Clark and Dan Lagan. He played for the New Zealand team the Crusaders in the international Super 12 competition and Canterbury in the N.P.C. He scored 35 tries out of the 50 Matches for Crusaders. He made his Test debut for Fiji in a match against Canada in Vancouver. He was then included in the Fijian squad for the 1999 Rugby World Cup in Wales, where he scored a try in the pool match against Canada. He was included in their 2003 Rugby World Cup squad, and scored a try in the win over Japan. Ranked as one of the quickest men to play for the Canterbury Crusaders alongside the likes of Vilimoni Delasau, Rico Gear and new speedster Sean Maitland.